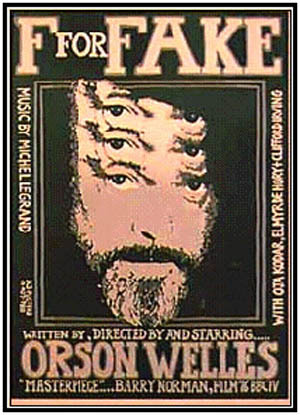 F For Fake, a film that sometimes plays like a documentary about an art-forger, Elmyr de Hory, who creates original works and signs them as Matisse or Modigliani, has only one credited director—Orson Welles. 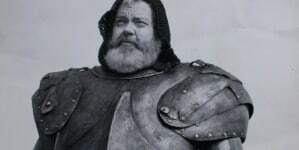 Nonetheless, there is some evidence to suggest that cinematographer Gary Graver and co-star Oja Kodar shot and conceived some segments, and Welles incorporated into his film some footage shot by François Reichenbach for a separate project. But one needs neither belabor nor contest this point, lest they miss the larger one altogether. 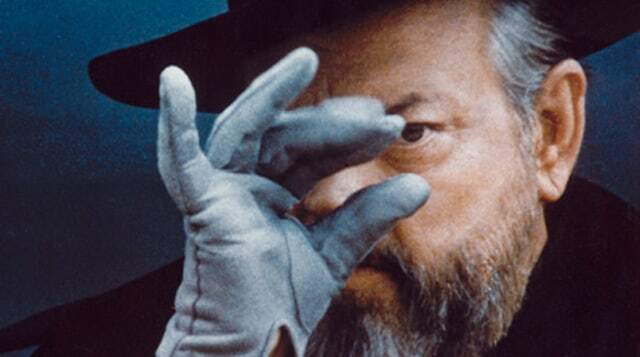 F for Fake is a film about the perils authorship and the hypocrisies of belief in it. Much has been written about German Expressionist influences in Orson Welles films, but in F For Fake, his final film, the influence of German Expressionism’s contemporaneous movements are far more visible, and it is in these movements that one of F For Fake’s central themes—the nature of authorship and authenticity—is rooted. In the early 20th century, a number of avant-garde movements ranging from Futurism to Suprematism to Dadaism were founded. Varied as they were, each saw itself as an antidote to the traditional art of vanguard culture; that is, a new form of art against the (Post-) Impressionism of Monet, Cezanne, and the contemporary Matisse. The avant-garde artists, from F.T. Marinetti to Kazimir Malevich to Marcel Duchamp, sought to reveal rather than conceal means of production in their works, stripping an art form down to its most fundamental qualities, namely line, color and form in the case of painting, and re-building it from the ground up to free it from adherence to reality. Perhaps the best such example is Malevich’s Black Square, which sought to return art to a universally held, entirely abstract origin from which anything could be borne. For Malevich, his followers and his contemporaries—particularly the Constructivists and Futurists seeking to create three-dimensional spaces rather than two-dimensional objects—art was authorless. It came not from an individual or a genius guided by inspiration but rather was the art of the proletariat reacting against the bourgeois and the past. The artist was less important than the movement and political-aesthetic ideas (and there was no separating politics and aesthetics at the time) from which it originated. It was an experience for the spectator meant to challenge them intellectually and encourage revolution, not an object for them to evaluate from an aesthetic or critical distance. F for Fake never explicitly mentions the avant-garde, but these ideals permeate the film. The notorious art forger de Hory finds that his fake originals credited to the great artists—Matisse, Picasso, Modigliani—sell handsomely, while those bearing his signature go nearly unsold. That said, numerous anecdotes are told in which museums cannot tell the difference between de Hory’s fakes and the real things, or in which so-called “experts” treat a painting differently depending on the name attributed to it. The implication is obvious: Names are valued more than the work itself, and that alleged authorship, true or false, is correlated with value. Museums, collectors, and experts engage to a ridiculous and indefensible extent in the kind of hero worship that the avant-garde railed against, and F for Fake meticulously uncovers the absurdities and hypocrisies in doing so. But Welles is nonetheless critical of these same movements. I should pause here to emphasize that Elmyr’s paintings are “originals.” He is not making a copy of a known Matisse or Modigliani and passing it off as the real thing; his practice goes beyond imitation into pastiche and genuine artistry. Indeed, the question of de Hory’s artistry is raised often, and it is inarguable that he is at least a highly skilled painter. And yet, his work isn’t great, at least according to the establishment. Of course, Welles’ film has much more on its mind than the silliness of an art market centered on artists. Like the avant-garde before him, Welles foregrounds his mode of production in a way that also matches the story being told. That is, a film about forgery is presented as a film in the making, suggesting that Welles himself is a fake. At one point, de Hory and his biographer, Clifford Irving, appear to debate whether the former ever signed his forgeries, but the shots were actually all taken separately and then edited together. 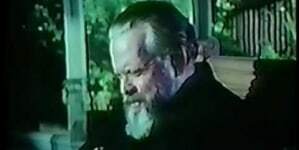 This is not immediately apparent, but there are recurring shots of Welles—who begins the film introducing himself as a magician, performing tricks, and waxing metaphysical on the nature of magic and acting—watching and editing his own footage, forcing us to question the reality of what is presented to us. Then again, after the brief introduction and magic show, Welles tells us that “during the next hour everything you hear from us is true and based on solid fact.” Sure, much of what we learn about de Hory and Irving, himself a faker, and even Welles himself is true, but Welles, staying in his magician’s apparel even as he addresses the camera and examines his footage, edits in such a way as to present lies in disguise of the truth (to paraphrase Picasso). Welles is thus doing nothing less than waxing philosophical on the ontology of cinema itself, taking Godard’s oft-quoted “cinema is truth 24 times per second” and examining the foundation on which such a statement is made. If it is recorded, did it really happen? 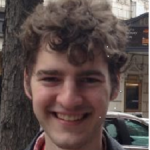 If it really happened, can editing make turn the truth into a lie? It’s clear, then, that another idea on Welles’ mind was the closeness between truth and lie, a theme that marks so much of his work. In Citizen Kane, to what extent can “Rosebud” be seen as an “answer” to his shortcomings as both man and businessman? 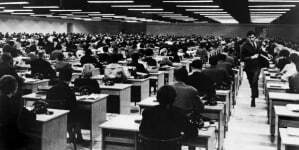 In The Trial, Josef K’s search for an explanation to his arrest is amplified by the film’s lack of geographical grounding for spatial coherence and consistency. These paradoxes, the separation between truth and lie, distance and proximity, desires and undertakings, even subjectivity and objectivity, only approach Welles himself asymptotically. In the best of them, Citizen Kane, we have a man (played by Welles himself), fictional but based on William Randolph Hearst, unable to see his own disloyalty to his Declaration of Principles, a fragmented and re-formed view of the past in which Rosebud acts as a piece that may or may not fit them back together, the disconnect between lost childhood and unfulfilled dreams on one hand and power and wealth on the other. In F for Fake, Welles has no need to play that man, he is that man, with the paradoxes embodied in the equation of magician and filmmaker. From that perspective, then, all of the inspiration, creative genius, and magic of art that the aforementioned avant-garde artists railed against are finally laid bare. Just as Welles allows us to peak behind the curtain to see Irving and de Hory at work, to recognize the artistry inherent in their forgeries, so he allows us to examine his own practice of filmmaking, that we may appreciate the genius of his fakery—fakery that is not just in F for Fake, but all his work. If he remains the star, it’s only so he can poke fun at his own stardom and question his own authenticity, as he does when he addresses his own success with War of the Worlds. As with the stories of de Hory and Irving, the basic facts are given, much is fabricated or invented—the “excerpts” we are shown were not present in his radio rendition of War of the Worlds. 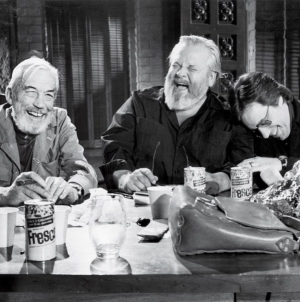 That Welles likens himself to a stage magician means he decries his own authenticity. A magician, after all, is nothing if not a phony. His tricks only work until you know how he does them, and even before then you know that they are tricks. 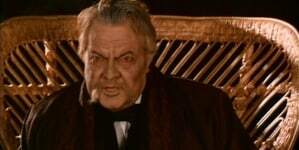 But if de Hory, Irving and Welles are fakes because their paintings are not drawn by who they claim, because their “autobiographies” are entirely works of fiction or because their films are closer to lies at 24 times per second than truth, then those paintings, that book and these films are very much real. They are authorless and valueless but not without artistry. If we return once more to Citizen Kane, we see that this inkling Welles has in F for Fake has clear roots. One of Kane’s bigger indulgences and showcases of wealth and power is his purchasing of European statues, arranged in the mise-en-scene inconspicuously and seemingly unimportantly but nonetheless noticeably. Art became a commodity and at that point ceased to be art, leading it to a place amongst all of Kane’s detritus, including his beloved Rosebud sled. In F for Fake, this undercurrent of Kane is expanded, becoming the subject of the entire film. It began as an inkling but emerged as the director’s most complex and defining statement. When it comes to commodification of art, it’s hard to beat the movies themselves, something acutely acknowledged by F for Fake’s reflexive nature and Welles own role in it. Indeed, one should not forget that that commodification ruined many of Welles films. The director had to change his intended ending for The Magnificent Ambersons, cut the runtime of The Lady From Shanghai nearly in half and leave many other projects unfinished. It is also worth stressing that film, unlike painting, is collaborative: It throws the very idea of authorship into question—so much so that the art form was half a century into its life before a lens that allowed for true authorship was formulated. That’s what makes F for Fake’s lack of crediting so notable and yet so pointless. In a film that, like the works of Duchamp and El Lissitzky, seems to spring forth out of movements and art theories rather than inspired geniuses, the name in the corner of the frame hardly matters. After all, is that painting really any better if de Hory signs Matisse’s name instead of his own? Welles fashions himself as a faker at least as grand as his subjects. So what do we do with this central paradox, since F for Fake seems to be anchored by Welles in more than just presence? How do we reconcile the idea of authorless-art with Welles’ directorial pedigree? Welles’ films have always operated on paradoxes, so who are we to balk at the biggest of all of them? That F for Fake withholds an easy answer or solution rather than tying everything together and wrapping a ribbon around it puts it in lineage with the director’s best works, a place where it firmly belongs.